Beetroot is one of the yummy vegetables that I tried for the first time in Australia. I think you can find them in the markets in Korea nowadays though it is unusual vegetables still. I only tried canned pickled beetroot for the first time >.< well..I didn’t know much about it anyway. It was nice though texture was mushy, very sweet and sour, thanks to canned food, full of preservatives. Then I recently started using beetroot more in my cooking since I discovered all the good things about this amazing little friend. Beetroot is rich in calcium, iron, vitamin A and C, a good source of fiber, manganese and potassium. The rich purplish red colour is betacyanin, a strong antioxidant and anti-cancer agent. It helps to beat high blood pressure, diabetes, osteoporosis, anaemia, fatigue and constipation. You can eat raw like me by grating and putting in salads or make home-made pickles (don’t buy canned pickles! please) or roast in the oven with a drizzle of balsamic. Since it is scorching 38 degrees here today, I didn’t even go close to the oven or stove today. Cold salad is a way to go! 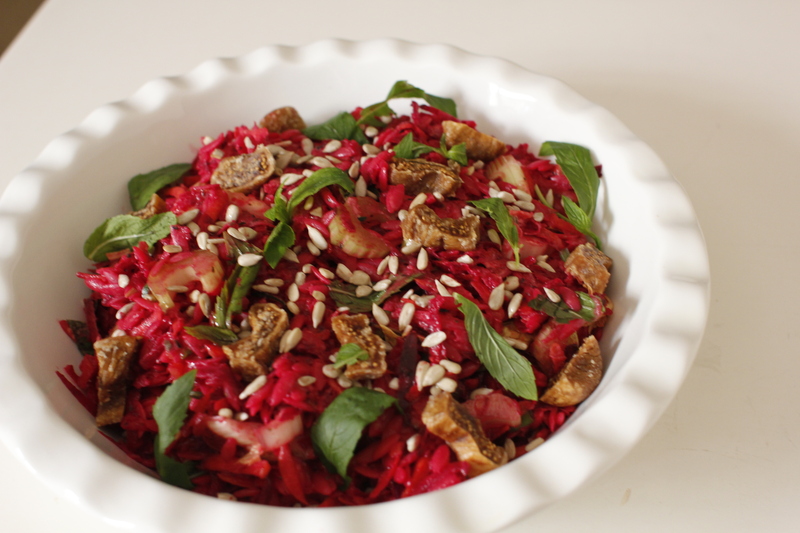 For this awesome red salad, I mixed orzo, carrots, beetroot, celery, zucchini and mint leaves. Season with good quality herb salt and pepper. Drizzle olive oil and lemon vinegar. Sprinkle sunflower seeds and sliced dried figs. I made this to take to my friend’s son’s birthday picnic party tomorrow. Hopefully everyone enjoys it! My mum sent me a couple of photos of snowing in Korea. It is a festive season soon, Christmas..New year.. I miss Winter Christmas..wearing a thick coat, scarf, beanie and gloves..walking around streets full of beautiful lights and Christmas trees..having hearty warm winter foods..